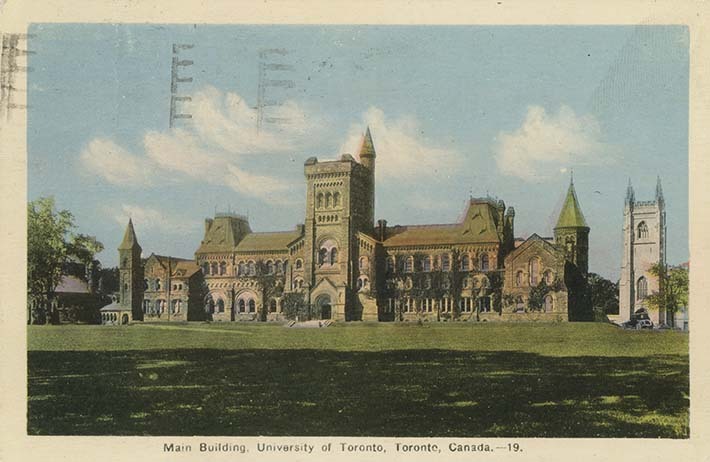 Colour postcard of University College, University of Toronto, written in Italian from Donato Sansone, to Ruggiero Bacci, April 18, 1943. Both resided in Toronto, ON, prior to their arrest. Sansone had been interned with Bacci; he had been released only two weeks before this postcard was written. Bacci refers to Sansone's release in a letter to his wife (see LICEA2012.0002.0011). In that time, Sansone had seen Bacci's family and notes that they are well. He asks Bacci to remain happy and calm. He also asks him to send his greetings to other campmates, along with his wishes for a happy Easter holiday, noting they are all in his thoughts. He hopes to see Bacci soon, noting they will paly a popular Italian card game known as "tre sette" in Toronto. Donato was a physician and had a medical office in Toronto. It is not known if he had any relationship with the University of Toronto.